Interesting how the city generally forgets about Beacon Hill’s existence except when they want to do something annoying. 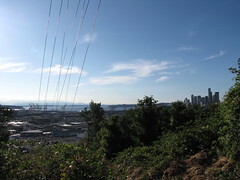 I’d trade those power lines (which are on my side of the Hill) for decent bus service, road repair and maintenance, the occasional useful response to crimes by Seattle police, etc. Sure, put a hole through my Hill but ignore what’s going on on top! What I’ve also found interesting is that in some parts of the hill City Light has been installing new power poles right next to old power poles without replacing the old poles. They simply cut off the top of the old pole leaving an ugly 15-20 stump with a single wire still attached (this is on 13th Ave by the way). 14th Ave on the north side of the hill is also interesting with multiple poles on both sides of the street, many of which aren’t used to hold any wires at all. Is there a plan to remove these at some point? I just spoke with Scott Thomsen at Seattle City Light about the old-pole situation. He said that, at this point, they’re waiting for the other entities that utilize the infrastructure (Qwest, Broadstripe, etc.) to move their services to the new poles and give them the all-clear signal. Once that’s been done, SCL will come back through and remove the old ones. SCL does not impose a definite deadline on this, however they do make an effort to get them to complete the transition in a timely manner. Re: old poles. This happened on my street a couple years back. The other utilities eventually came and moved their service lines to the new pole, but it took over a year as I recall. But shortly after they did that, SCL was back to remove the old pole. So don’t hold your breath, but it will eventually get taken care of. Re: the wires. Doesn’t seem like a huge issue to me. There are overhead wires everywhere on the hill, and everywhere throughout the city. Ok, I’ll admit it is a minor impact to the view, but the alternative of undergrounding these wires would be unbelievably expensive. they did this about 2 years ago along MLK. Moving all the power off of MLK and pushing it to high voltage lines about 2-blocks to the East of MLK, running parallel. Why they couldn’t underground them or keep them on MLK is because ST didn’t want them there. Of course, we all know that if this was anywhere else but SE Seattle, it would have been handled differently. Funny how all the properties were re-assessed about the same time. Structure values decreased significantly while land values increased by the difference and then some. Mine swung by more than 160k. Neighbors assume that soon the zoning will also change from single family to multi and apt for a 1/4 mile on either side of the rail…. Actually, if you took a look at the high voltage transmission lines coming into the city from the north, you’d realize how fortunate we are. At least the south end has the transmission corridor, with its generous buffer. The lines coming in from the Skagit are literally in people’s back yards. Eighth Avenue NW also has some serious voltage on it. There’s a fair amount of the electrical infrastructure on the south end that is undergrounded, but there’s only so much stuff you can put in the ground. Plus, if it faults out, it’s expensive and much more time-consuming to fix. Sound Transit just put a hole through our hill the size of a house. It is hard to understand why they wouldn’t put the high voltage lines needed to run their station through the tunnel and bring power up from below. It would actually be easier to maintain and safe from wind and weather. I blame City Light. They failed to negotiate this with Sound Transit. Jorge Carrasco should give up his $40,000 bonus to figure how to right this situation. It cost $1 million to put on the party on Saturday, $304 million to build the tunnel, Sound Transit should have put the lines underground (KOMO quoted City Light cost estimate: $1 million-same as the one day party). Without getting too wonkish and just inexcusably boring, it’s a really, really bad idea – if even allowable by code – to put utility owned transmission or distribution lines in a space that is not owned by the utility. It requires special easements, and can be a detriment in case of an emergency in the tunnel, because it could A.) create an additional hazard, and B.) leave the facility without power in case of a failure of that line. If anyone remembers the mess created back in the 70’s when the tanker truck blew up on the viaduct and melted some of the lines that go into downtown, that is a prime example of what I’m talking about. The transmission corridor, on the other hand, is already owned by the utility. Since it’s their land, they can do what they want with it, with minimal cost to the ratepayers (the vast majority of whom value low rates over the effects of power lines on view properties). After all, all they did was raise the height of the poles (due to the increased voltage) and put in thicker conductors to accommodate the additional load.